Note: Wettlauf Nach El Dorado is now available in English as The Quest for El Dorado. What will it take to draw you out of the lazy lifestyle you’ve become accustomed to? GOLD. Lots of it. Beautiful, delicious, valuable GOLD. And now you know where it’s located. They call it the lost city of El Dorado, but you seem to have found it. So call in your favors with rich heiresses, hire the very best machete-wielders that money can buy, and hope you have enough oars to get you through this dense and dangerous jungle. Because while there’s lots of gold in El Dorado, the glory (and the book deal) only goes to the first one to get there. 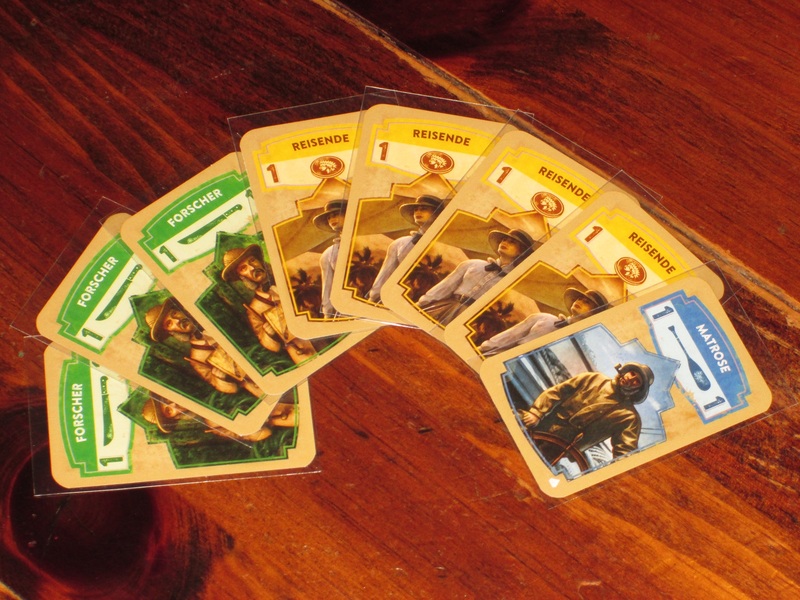 Wettlauf nach El Dorado is a deck-building racing game for two to four players. 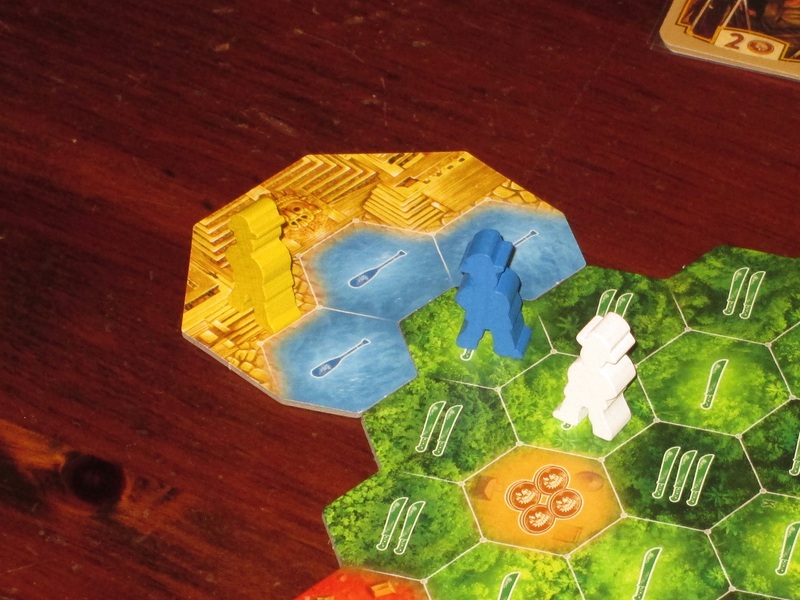 Players are explorers trying to be the first to reach the lost city of El Dorado. The first player to reach El Dorado wins. Wettlauf nach El Dorado set up for three players. This is the recommended first track for new players. To begin, each player receives a personal deck of cards. 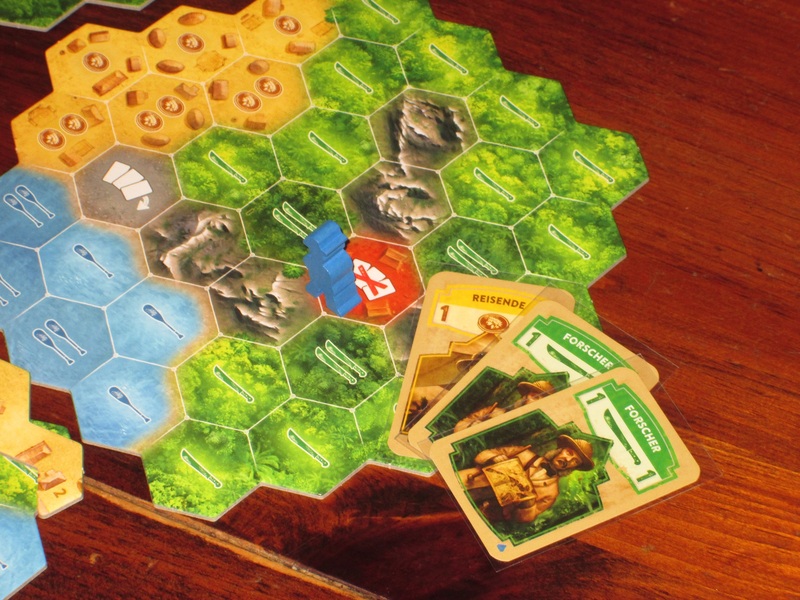 Players set up the map either according to one of the preset maps in the rules or according to their own fancy, and a boundary piece is placed between each joint of two map boards. The market board is filled with the starting market cards, and the other cards are laid in piles above it. 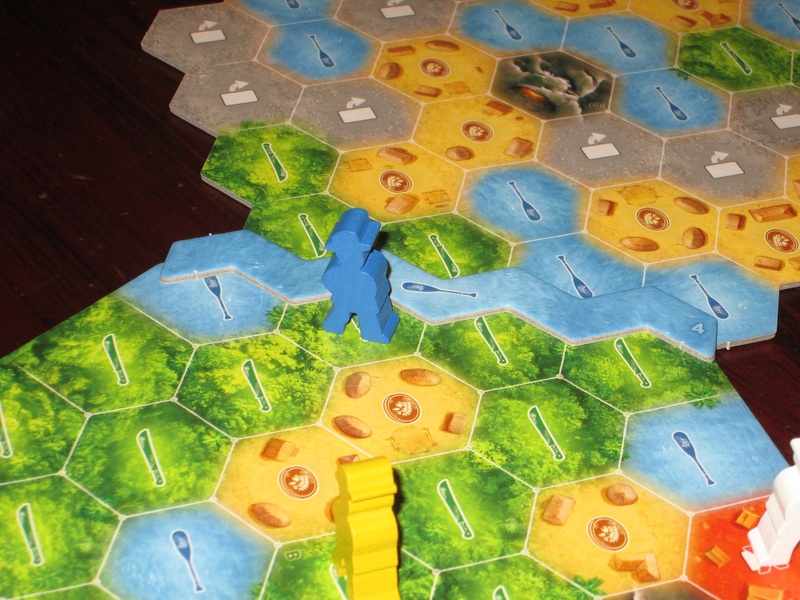 A start player is determined, and players place their explorer pawns in turn order on the marked spot on the first board. Players shuffle their cards and draw four. Each turn a player may move their explorer and/or buy one card. To move their explorer, the player must play a card that matches the terrain of the space they want to move into and meet the strength requirement of that space on the card. (For example, to move into a two-machete space, a player must play a two-plus-machete card.) Any excess strength can be applied to the next spaces, but players can’t add cards together to reach the strength of a space. Spaces on the board are either jungle (need machetes), water (need oars), villages (need coins), gray spaces (need to discard a number of cards), or red base camps (need to remove card[s]from the game). Whenever a player reaches a border obstacle, the player must play the symbols shown on the obstacle (just like moving into a space), and the first player to do so claims the obstacle, removing it for all players. A player may also buy a card from the market. Only the cards on the market board are available to buy. Players may use coin cards for their value to purchase. In addition, players may discard any other cards for 1/2 coin apiece. Bought cards go into a face-up discard pile. The back of the setup sheet shows several courses through El Dorado. The map tiles have letters on them, so it’s easy to set them up as intended (or to make your own courses and post them for others). Once a player has moved and/or purchased, the player may discard or hold any cards in hand and redraw up to four cards. At any time, if the player needs to draw cards and has none to draw, he or she shuffles the discard pile to make a new draw pile. 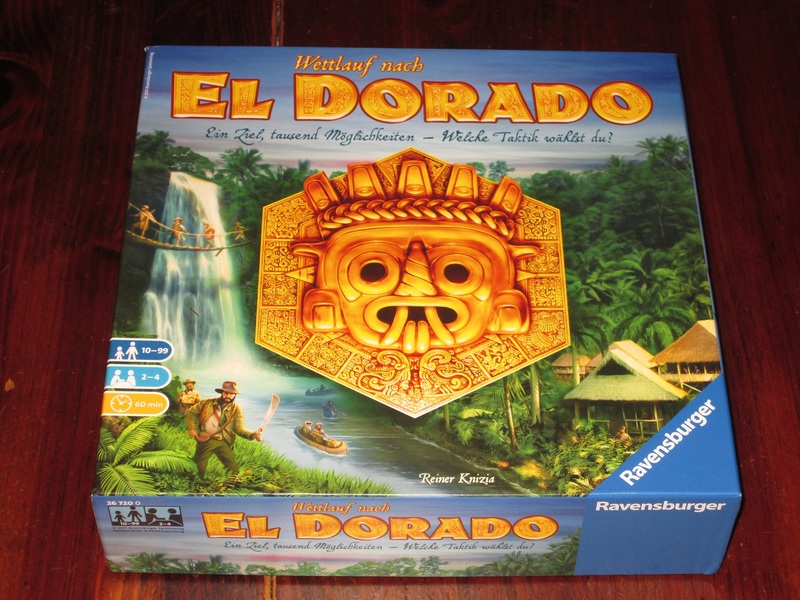 The game ends at the end of the round when one or more players reach El Dorado. If just one player reached El Dorado, he or she wins. If multiple players reached it in the same round, the player among them who has claimed the most border obstacle pieces wins. 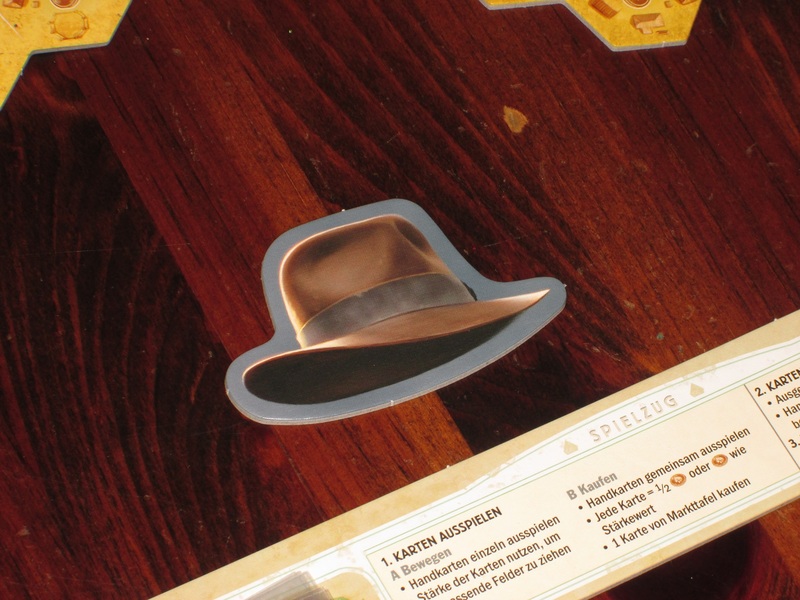 For many, the announcement of Wettlauf nach El Dorado’s nomination for the most prestigious gaming award, the Spiel des Jahres, was enough for them to take notice. But for some of us, just one name was enough: Reiner Knizia. It has become fashionable to dislike Reiner Knizia. “He had some good games come out a while ago,” scoffers say, “but what is he doing today? Churning out lots of rehashes,” etc., etc. Never mind that many of Reiner Knizia’s older games weren’t just good when they were originally released–which is why so many of them were given new coats of paint just last year–they are still classics, and for this reviewer, at any rate, more interesting than a lot of what is currently hyped. “Was bedeutet ‘deckbuilding-Brettspiel’?” (Or, “What does ‘deck-building game’ mean?”) The back of the box clues us in that this is a game aimed at families who may be unfamiliar with the deck-building concept. Oh. But you wanted to hear about the new Reiner Knizia game–a deck-building game, which is something he has never done before. Well, even though it uses a new mechanism (and eliminates much of the mathy calculation Knizia is known for), Wettlauf nach El Dorado has Knizia’s fingerprints all over it, which will delight his fans and probably cause others to prematurely dismiss it. 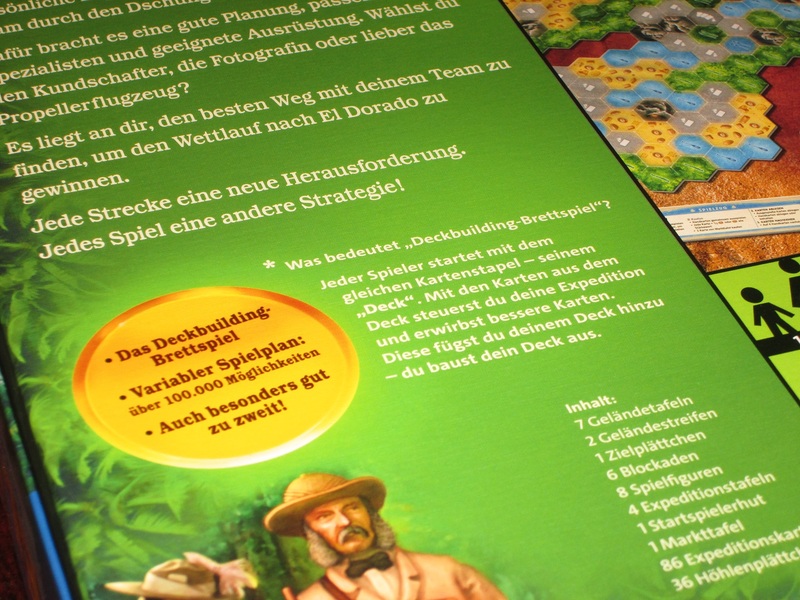 But “prematurely” is the key word there: while Wettlauf nach El Dorado is certainly a simple, family-weight game, there is a lot to explore in the jungles surrounding the golden land. I have always been impressed with how replayable Knizia’s games are, but they are not replayable in the way gamers typically describe it. When talking about “replayability,” people entrenched in the board game hobby are usually talking about expansions, player powers, different starting conditions. In a word, variety. 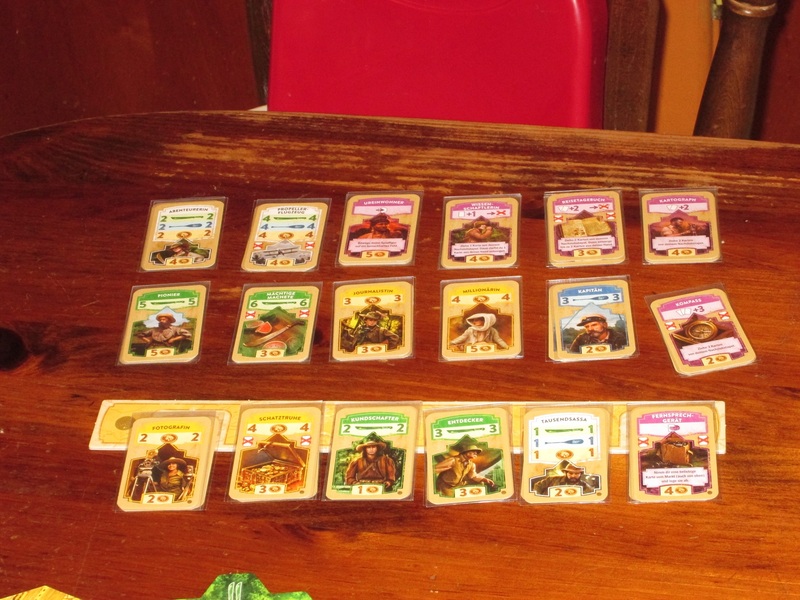 Knizia’s games rarely rely on something as fickle as variety for replayability. Rather, they are replayable because they are interactive and require the players to adapt to what the other players are doing. 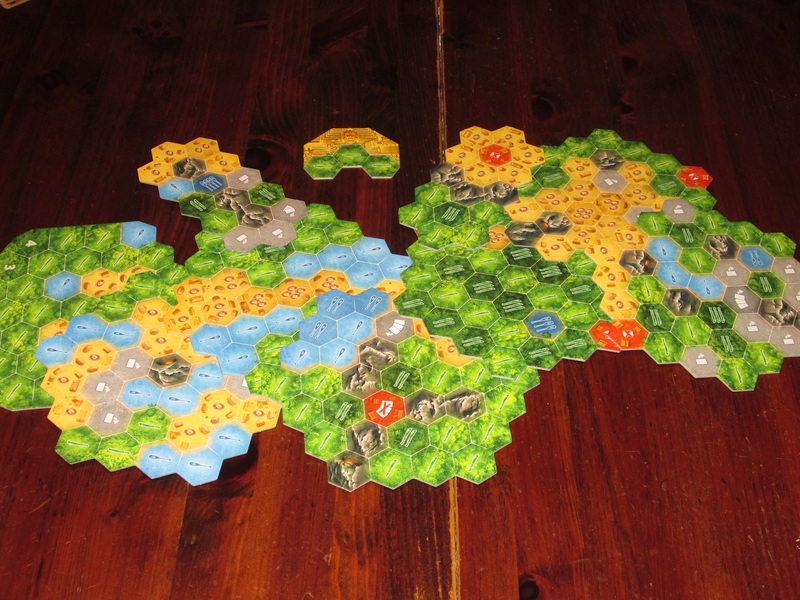 Think about it: the games Knizia is probably best known for are his auction games (especially Ra, Medici, Modern Art, and Amun-Re) and his tile-laying games (Tigris & Euphrates, Samurai, and Through the Desert) and his two-player hand-management games (Lost Cities and Battle Line). In the auction games, the prices players pay are determined by the players themselves. The rules for each of those games are slight, yet I am willing to play them anytime–and each game will be different–because players determine the value of what’s on offer. Similarly, his tile-laying games are endlessly replayable not because of variable player powers or starting positions but because when another player plays a tile, I have to decide how I will react. Do I try to usurp his gains, or do I think I can gain more by striking out on my own? Lost Cities and Battle Line have proved to be staples in so many households (my own included) because each game requires risk and response: you can’t simply look at your own cards and do well; you have to track what your opponent is up to. Did I say Knizia doesn’t usually do variety in the usual sense? Well, here are seven large map boards, two smaller map boards, and the final destination board, all double-sided. 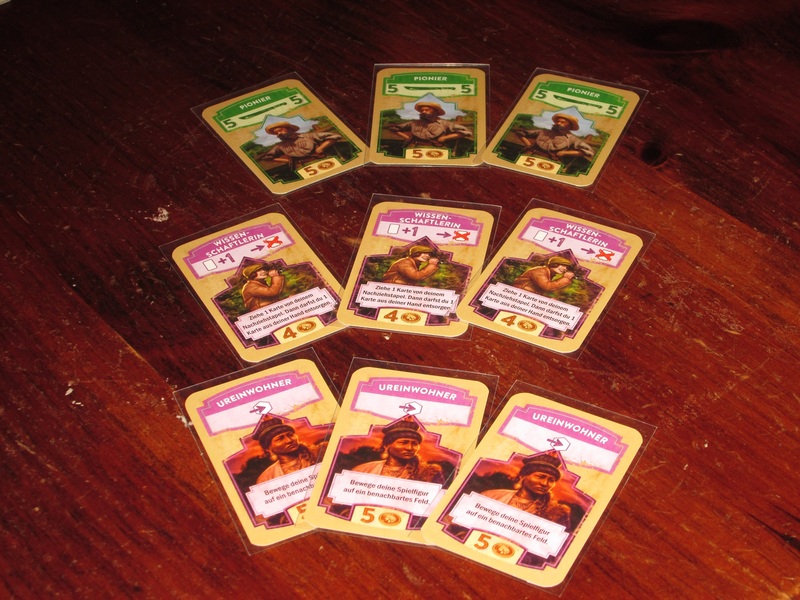 Variety meets Knizia’s typical players-based replayability model. Back to Wettlauf nach El Dorado: what is interesting about this design is that it has both the variety that gamers now expect and the player interaction that makes every game different. Variety comes in that there are seven different large map tiles included in the box (plus two smaller maps and El Dorado), each double sided, and each requiring different tactics to reach the goal. You can change the route each game, and after you’re done running through the recommended routes included in the rules, you can make your own however you like. But if all that was present was variety, I’d probably get bored (unless it’s the endless variety provided by a game like Dominion). In Wettlauf nach El Dorado, the player interaction shines. The card market. In addition to the six starting cards, there are twelve other card piles. All of them are present in each game. One way it shines is the card market. 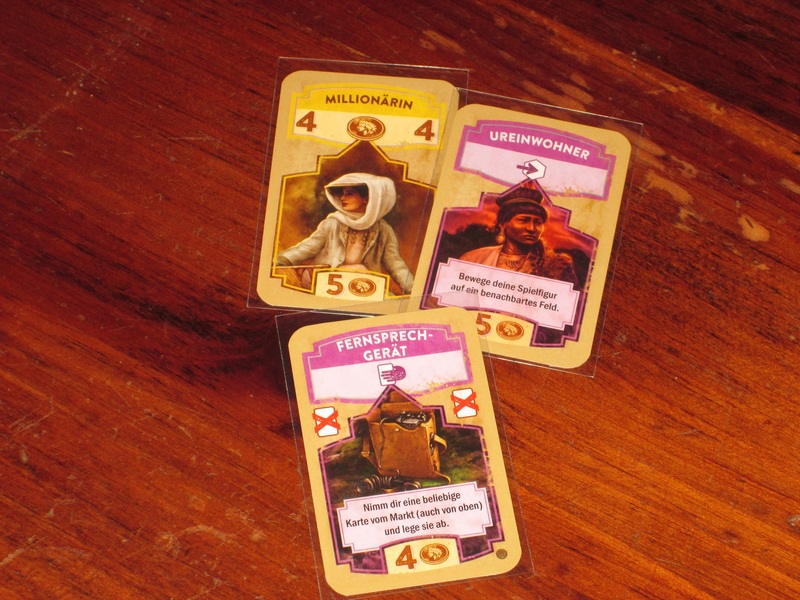 Wettlauf nach El Dorado is strange in that it combines the pile supplies of Dominion with the “every card is in every game” idea of the Ascension-style deck builders. Wettlauf nach El Dorado comes with 18 unique piles of cards, but the same piles are in every game you play. You might be thinking, That sounds like it would get old fast, and it does sound that way, but Knizia has, again, found a way to hit on making the so-simple-it-sounds-boring concept interactive and engaging. Every card is in every game, but only the cards in the market are available, and unlike Dominion, where each supply pile has ten cards and if you really want a card, chances are you can get a copy, there are only three cards available in each stack. Three cards. That means that in a four-player game, at least one person will be unable to add a copy of each card to their deck. Even if you want to hit the same levers every game, your choices are dependent on what everyone else does. If all the other players snap up the Millionaire cards before you have a chance to, you are forced to find a new path to victory. An open space in the market. What will you buy? Your choice dictates the options available to your opponents, so choose wisely. The market provides another challenging point of player interaction in that only the cards in the market are available, and new cards only enter the market when another card stack is bought out. When that stack is bought out, the next person who buys a card can buy any card, and if they purchase a card from above the market, that card now enters the market. So if you buy the last card in a stack, you are opening opportunities for the next player, who will then dictate the opportunities available to all the other players. This is, quite simply, brilliant. Even in a game like Star Realms or Ascension, where buying new cards opens opportunities for the next player, you don’t know what opportunities you’re opening up. In El Dorado, you know exactly what you’re doing. Maybe you avoid buying the card you really want to keep it out of other players’ decks. Or maybe you buy it anyway, hoping that the player who needs it most won’t be able to afford it when his turn rolls around. So even though the same cards are available in each game, the small supply of cards and the variability of what’s available–again, both dictated through player choices–makes each game feel different. The obstacles. 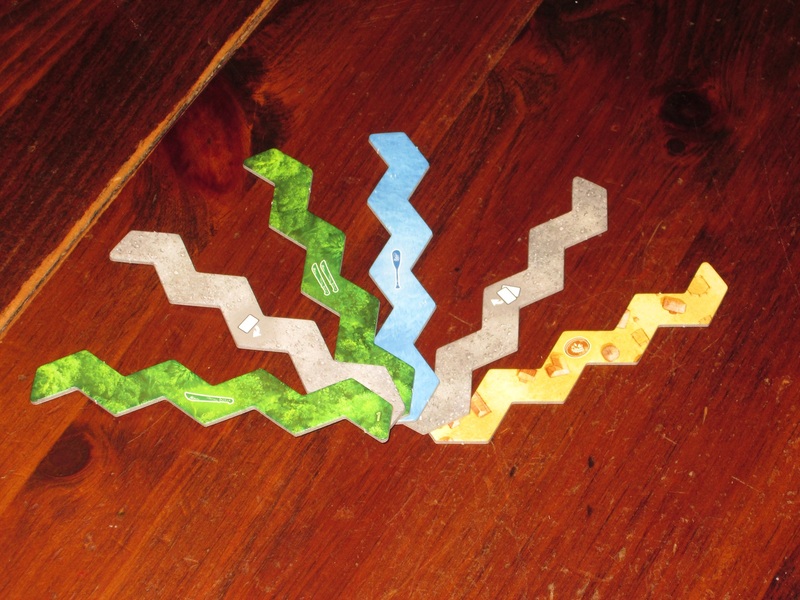 Each joint of two map tiles is covered with an obstacle. The first player to cross must first meet the requirements of the obstacle. These obstacles prevent runaway victories, yet they also serve as a fair way of breaking ties. The variable map tiles make each game different, but what really makes each game different is the multiple paths (literally) to victory. In one game I played recently, four of us were at the table, and four of us chose completely divergent paths. One player decided to move early, not improving his deck much but simply plodding forward through brute force, playing card after card each turn. Another player was able to make his deck lean through removing weak cards, so he was drawing good stuff each turn. Another player ignored money and oars and bought up a lot of the machete cards, hacking a roundabout path through the jungle, but making up the hit in distance through high-powered machetes. And I took a combination strategy, exploring caves (a variant I’ll discuss in a moment) to try to get the edge over my opponents. In this game, the player who hacked through the jungle won, but the rest of us were hot on his heels. And I like this: at the end of the game, you can see the viability of certain paths, and you can see how any one of them could have worked if hewn to a little more closely, but ultimately players are responsible for their own choices. Blue is stuck at the obstacle. My kingdom for an oar! Because the choice in the game, much like the choice in Dominion, is when to give up improving your deck and when to make a break for what matters. 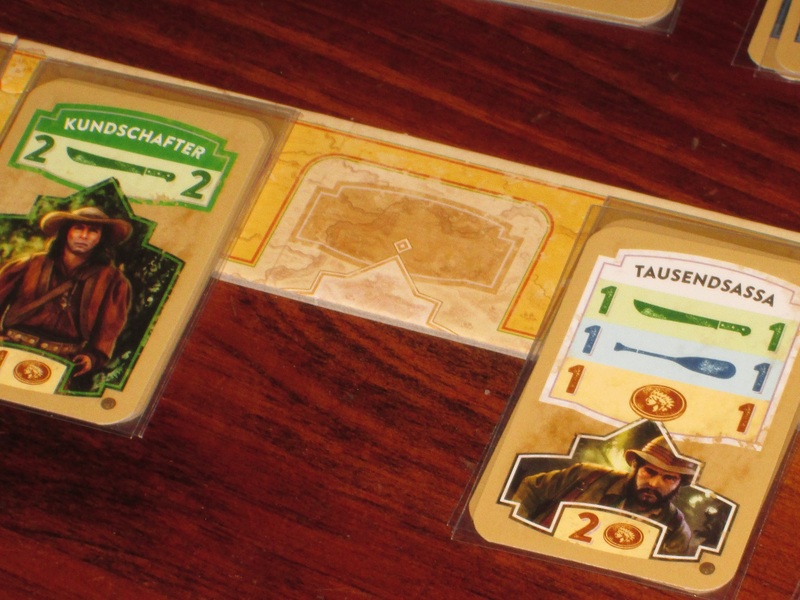 While this transition is more opaque in Dominion (especially because victory points are privately tracked in each player’s deck), in Wettlauf nach El Dorado, it’s easy to see where you rank in the race. What’s not easy to see is when to make a run for it. Should you get better cards to let you go farther when you do move? Should you shed your worst cards so you only draw your better cards? Should you make short progress, but make it consistently? Each map demands something different of players, and the pace is set both by the kind of terrain in your way and what other players are doing. There is some luck in the game, but more often than not, player choices dictate the menu of options available on any given turn. The first player marker. Remind you of anything? I do like that “dead” cards in a player’s hand can be used for extra purchasing power in El Dorado. Did you draw your oar cards with no water in sight? Two bum cards equal a coin, which could be the shot in the arm you need to get a better card you’ve been eyeing. And you are allowed to save cards from round to round (rather than discarding your hand at the end of your turn), so if you get a card that isn’t useful now but will be soon, you can keep it safely tucked away for the moment of greatest need. El Dorado, unlike most other deck-building games, has a strong hand management puzzle, because you have to decide which cards will help you move, which ones should be used to buy, and which cards you should hold on to. In Dominion, the decision points are more what goes into your deck, and your individual turn is mostly playing the cards in your hand according to the strategy decided. Each new hand is a fresh puzzle in El Dorado. There are only three copies of each card available. This both focuses players (you have to be choosy when you buy) and forces players to choose different strategies, especially in a four-player game. Cave tiles provide a good variant for experienced players. Should you gamble away your lead for the chance of a better lead? You might find just what you need in the caves. It’s also possible to make the game more challenging for advanced players. You can make the map longer, include harder barriers, and include the cave variant to add more interest to the game. 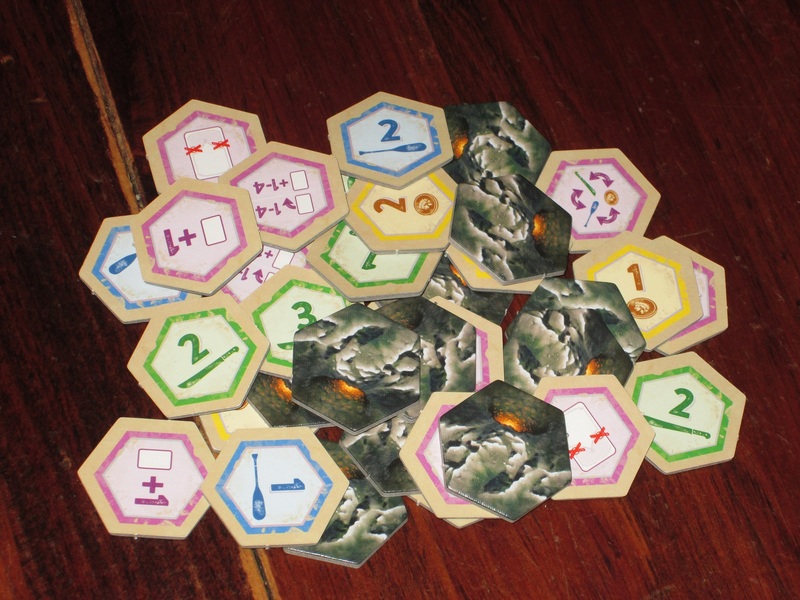 The cave variant adds four tokens to each cave on the board, and when a player moves adjacent to the cave, he or she takes a token. The token can be spent at any time and usually provides extra movement, card draws, trashing abilities, or other benefits not available through cards. This adds another temptation to the game: rush straight for the end, or try to pick up a small advantage by a little light spelunking? The cave variant doesn’t add too much to the complexity of the game, but it still is probably better to start new (especially young) players with the basic game. Trashing three cards may seem like a lot to enter this space, but it just might be worth it. I should add, too, that the game is approachable and simple to learn, but there are still moments of surprise. 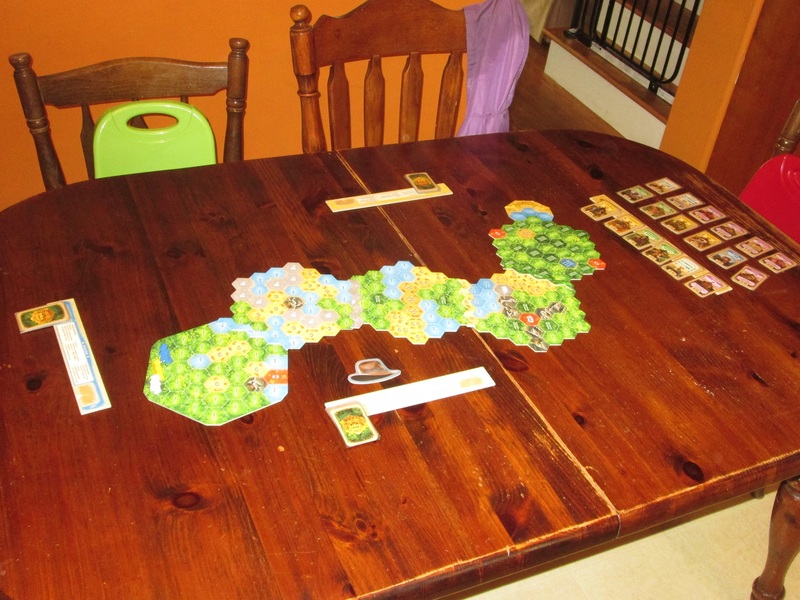 The first game I played, I looked at the board, and the path to El Dorado seemed so straight. I knew exactly how to get there…until I realized halfway through that the cards that were well suited toward getting me to that point were not the same cards that would get me to El Dorado. I reached a bottleneck where the spaces around me were too strong for the cards in my deck. And there are moments of surprise like this in each game I’ve played. Also, as you play more and more, you can see the value in trying something new–like hopping in front of a rival explorer, forcing them to take a different path than perhaps they had planned for. Because explorers can’t move onto or through a space containing another explorer without a special cave tile, blocking can be an effective strategy. Again, none of this is stated in the rules–it emerges through playing the game, and moments of discovery happen frequently during play. The journey of a thousand miles begins with a single step…that is, a deck full of weak cards. Each deck has a small symbol on the bottom right, noting which player these cards belong to. This makes sorting after the game a cinch, especially since these are all cards you’ll want to ditch as you play. 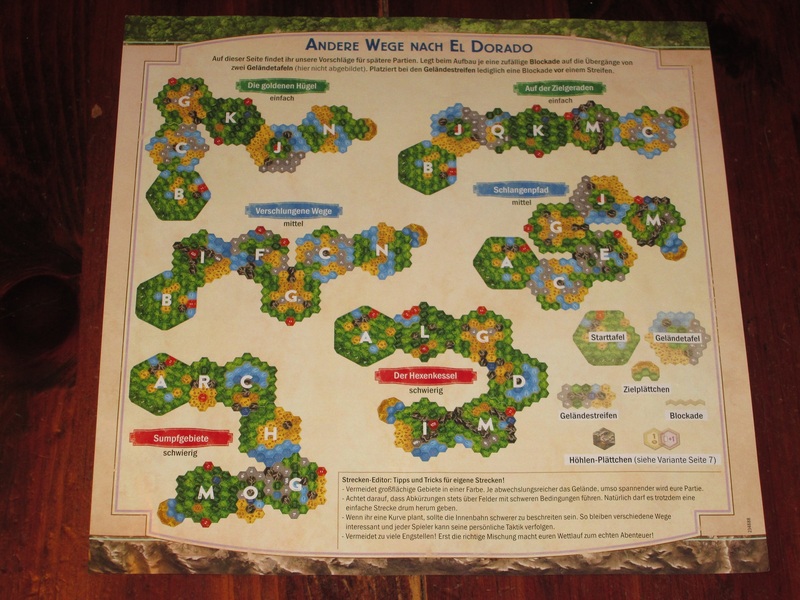 It should be obvious from what I’ve said that I think Wettlauf nach El Dorado is a good game, but there are a few things to be aware of that might make you less keen to start the expedition. For one, the game is currently only available in German (although an English edition is on the way), and while there is no necessary in-game text and (unofficial) English rules translations are available on Board Game Geek, some players might be distracted by this. (It doesn’t bother me.) I had to import my copy from Germany, which is easy enough to do in the Age of Google, but it can be a hassle, and there’s always a moment of panic involved with international shipping. The player aids/boards for El Dorado. Not helpful if you don’t know German. Then again, to experienced players, these won’t be that helpful anyway. This card let you bypass the market and grab any card, regardless of the cost. The components in Wettlauf nach El Dorado are very nice. The map boards, cave tiles, and market boards are on thick tile, and the map boards are double-sided, which is outstanding. The boards and cards are well illustrated with bright colors. They’re eye-catching and capably done and great for the family audience, but they’re not overly exciting to me. The player cards are the mini Euro size. I would prefer larger cards for my meaty paws, but this isn’t a deal breaker, and the decision makes sense. The game already takes up a lot of table space (especially if you play with the more advanced maps), and a small player board is included for each player with reminders of the rules (although if you get the German version of the game, these aren’t helpful unless Sie sprechen Deutsch). El Dorado advertises play for two to four in about forty-five minutes, and that’s accurate. The game plays well (and slightly differently) at all counts. I’m partial to the four-player game because the interaction in the card market is fiercer and it forces players to try new things, but the two-player game is also quite satisfying. 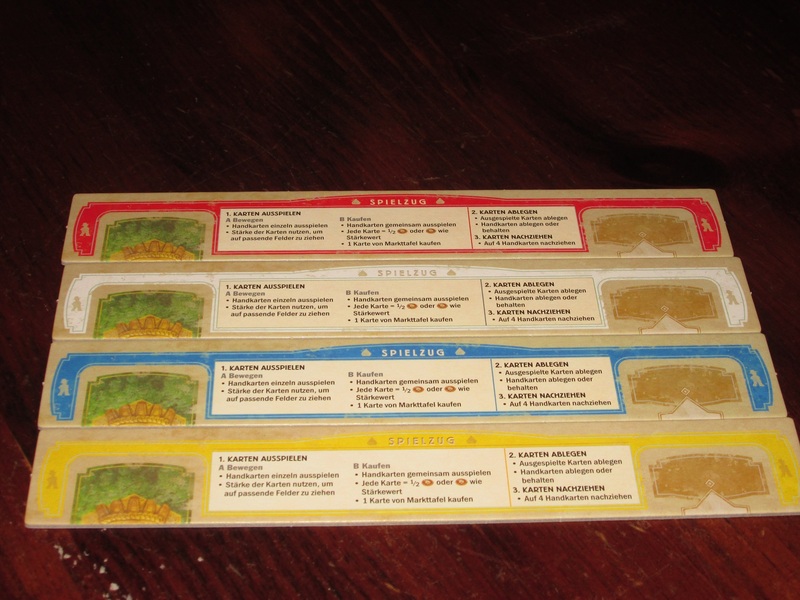 (Each player controls one deck but has to get two adventurers to El Dorado to win.) And the three-player game is fun, too, and might provide the best ratio of downtime and competition. I wouldn’t refuse this at any count. The Friday before the Spiel des Jahres nominees were announced, I wrote on our internal iSlaytheDragon Slack that I thought El Dorado would win the Spiel des Jahres, and I still think so. It’s got the look and the legs the award needs to attract and retain families at the table. But regardless of whether El Dorado clinches the biggest award in board games, it’s worthy of your time and consideration, especially if you’re looking for a great family game. It’s an enjoyable race, and one you can make over and over again. Knizia may be finished designing the deep strategy games he became known for, but don’t count the good doctor out. He still has plenty of strong and innovative ideas, and Wettlauf nach El Dorado is the proof.